A Lynchburg man appearing on a bench warrant in the Hillsboro Municipal Court on Monday was found guilty of a probation violation and sentenced to 180 days in jail. Court records show that a warrant was issued for Max E. Wells, 28, in April after he failed to appear for a review hearing. He was convicted of first-degree misdemeanor driving without consent last September. The Times-Gazette previously reported that Wells entered an agreement on allegations that he had taken a car, used it, and then left it in Clinton County, as described in an affidavit. In September, a 180-day jail sentence was suspended, and Wells was placed on reporting probation. He was ordered to obtain counseling. On Monday, Wells was found guilty of a probation violation. His previously suspended sentence was imposed and began on Sunday when he was arrested. Also sentenced to jail was Jeremy Pinkerton, 32, New Vienna. Records show that he pled no contest to first-degree misdemeanor theft last year. He was found guilty, and all but 20 days of a 180-day jail sentence were suspended. Pinkerton was placed on reporting probation and ordered to have no contact with Walmart, to obtain counseling, to observe a curfew, and to perform 80 hours of community service. A $1,000 fine was suspended. Records add that jail time has been imposed and furloughed on Pinkerton’s case. Most recently, Pinkerton was furloughed into the day-reporting program in March. This past Friday, an affidavit was filed by the Highland County Probation Department, and Pinkerton was scheduled for a probation violation hearing, according to records. On Monday, Pinkerton’s past furlough was revoked. A 41-day jail sentence began when he was arrested on Friday. 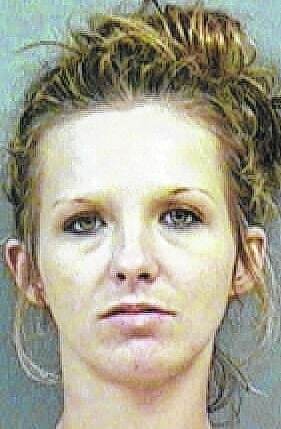 A seven-day jail sentence was scheduled for Kellie Kinnett, 26, Winchester. Records show that she pled guilty to theft this past November. All but one day of a 60-day jail sentence were suspended. Kinnett was placed on reporting probation until ordered community service and a theft class were complete. She was also ordered to have no contact with Walmart. In March, a warrant was issued for Kinnett’s arrest after she failed to appear for a review hearing, according to records. She appeared on that warrant last month. The Times-Gazette previously reported that Kinnett told the court that she had not appeared previously because she was incarcerated in Mason County, Ky.
Kinnett said that she was awaiting a trial there on a felony for complicity to robbery. She said then that the case was “likely to be thrown out for lack of evidence.” Kinnett said she was also charged with a misdemeanor for promoting contraband. She was released on her own recognizance (OR) bond and ordered to have no contact with a co-defendant in her felony case. She was placed on reporting probation until her felony case is resolved, according to records. On Monday, Kinnett was found guilty of a probation violation. A seven-day jail sentence is set for September, records show. In other cases, a $7,500 bond was set for a Hillsboro man charged with nine counts of attempting to purchase an illegal amount of pseudoephedrine, all second-degree misdemeanors. An affidavit filed with the court states that an officer with the Hillsboro Police Department was reviewing the NPLEX website on Friday. NPLEX is “an internet gateway for law enforcement to monitor pseudoephedrine purchases at pharmacies,” according to the affidavit. The officer allegedly “observed that Jamison H. Doyal was blocked at Walmart … on this date (June 12) … for attempting to purchase nine or more grams of pseudoephedrine within a 30-day consecutive period,” the affidavit states. The affidavit adds that the officer found Doyal, 40, was allegedly blocked from purchasing pseudoephedrine a total of nine times at both Walmart and Walgreens since April. The affidavit adds that Doyal did not “admit to whom” he had traded the pseudoephedrine. Doyal was arrested and transported to the Highland County Jail. He appeared on his charges in the municipal court on Monday. If Doyal posts his bond, he will be on electronic monitoring house arrest. While his cases are pending, Doyal is prohibited from having contact with Walmart and Walgreens. Pretrials are set for July 10. A $7,500 bond was also set for Alicia Ralston, 27, Greenfield. She appeared on both a bench warrant and a new charge, records show. Records add that the bench warrant was issued last month after Ralston allegedly failed to comply with the probation department. She was found guilty of a second-degree misdemeanor possession of drug abuse instruments last September. Her bond was set on that case. On Monday, Ralston was also arraigned on a charge of theft. While that case is pending, she is to have no contact with Walmart, must observe a curfew, and must enroll in substance abuse counseling “immediately,” according to records. She is also prohibited from driving. Records add that Ralston is on reporting probation. A pretrial for her new charge is set for July 17. A probation violation hearing will also be held at that time, records show.